The velociraptor is a well-known carnivorous (meat-eating) dinosaur, although scientists now think it was not much bigger than a very large chicken. 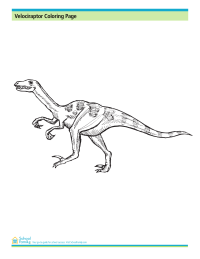 Use your imagination to color this velociraptor. 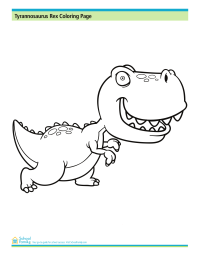 The tyrannosaurus rex is one of the most well-known (and most feared) dinosaurs, but the one pictured here is more friendly than fierce. This dinosaur is named for the three ("tri-") horns that are on the top of its forehead. 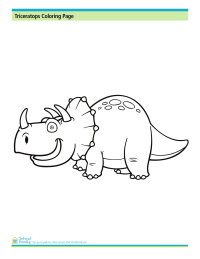 Enjoy coloring in the triceratops on this page. A stegosaurus is known by the spiky plates that cover its back. 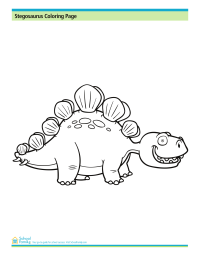 Have fun with this coloring page showing a stegosaurus. 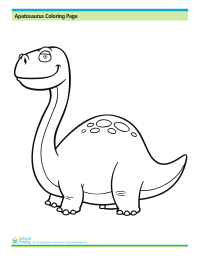 A friendly apatosaurus (formerly known as the brontosaurus) is ready to be colored in.